The dichotomy between today’s foodie culture and sustainable eating often looks like exactly the same thing. 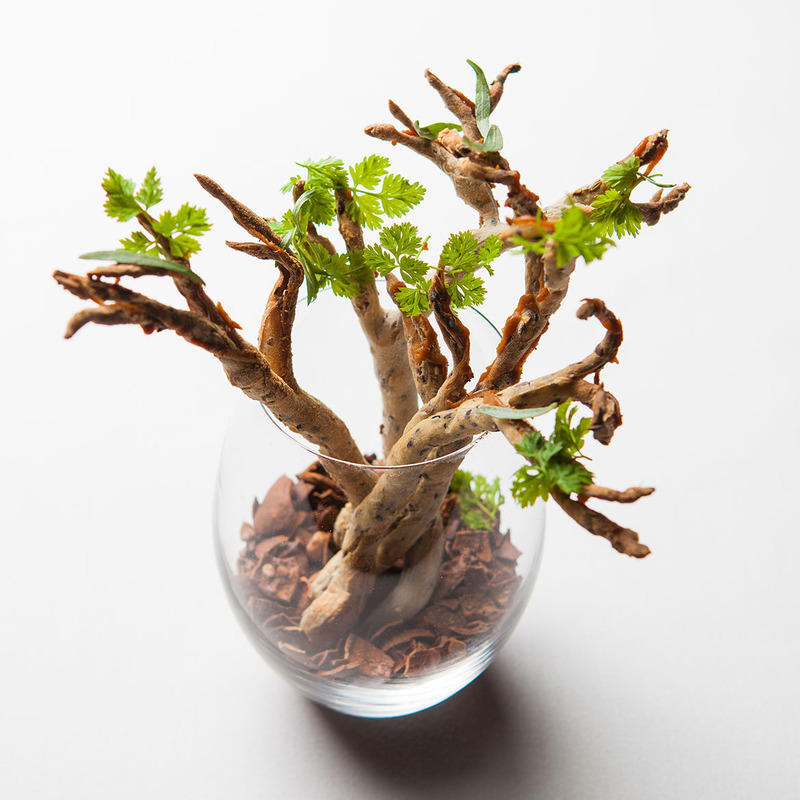 We want the best flavours, the freshest produce and ingeniously prepared dining. We want to see the words ‘local’ and ‘organic’ appear at least once in the dish we’re about to order from the newest, hottest restaurant. We tend to think of these labels as sustainable eating benchmarks. But are these really the best ways we can eat sustainably? Well, yes, but also… not quite. They don’t paint the whole picture – these labels are just the easiest to discuss. A tougher sell to foodies, is building frugality into every step of the food system, to value more than just the epicure. In a world where we toss out over one third of global food production, while almost two thirds of the human population lives in food insecurity, the question has to be asked: Can we have our flourless, heirloom citrus cake with hand-picked elderflower icing and eat it too? QAGOMA’s Executive chef Josue Lopez believes so, but we’ll need to redefine what we consider to be our ‘cake’. Eating local and organic isn’t going far enough. The unusual theme for the recent collaboration dinner was ‘Wasted’; a challenge to create five courses exploring how we can rethink our approach to food, waste, opportunity, and value our food system differently. If you thought overcoming food waste is going to be saved by nose-to-tail or farm-to-plate philosophy alone, Lopez’s and Matthews’s approach invites you to dig a little deeper. The discussion on the night probed the ways our current food system justifies food waste as a necessary act of profit making – the economy of scale in mass food production is clearly no longer economical. Lopez and Matthews are both passionate about how their menus are executed in the sourcing, planning and preparation stages and the ‘Wasted’ theme was a welcome opportunity to talk about those philosophies out in the open. Even an entry-level foodie knows chefs reuse food off-cuts to make other food items, such as stock – but this philosophy carries through the entire menu development of the GOMA Restaurant and The Long Apron and you wouldn’t know it to look at the end product. ‘Wasted’ was a welcome chance to put celebrity status aside, and talk about those decisions. Lopez is big on narratives, being surrounded by the Gallery of Modern Art’s walls and the stories behind the artworks. He’s adamant that any dish he creates is a reflection of the many stories that went into making it – where the produce was sourced, how the animal was raised, how it’s parents were raised, and where, and what it ate. He insists that farmers, producers, consumers and chefs still aren’t the entire cast of our food story. There’s also the people who connect our favourite kitchens to the source of overlooked or unconventional producers – passionate providores like 20-year food veteran Shirley Harring, who deals between sustainable farmers and chefs or consumers who really get it, and with surprising food sources to boot. 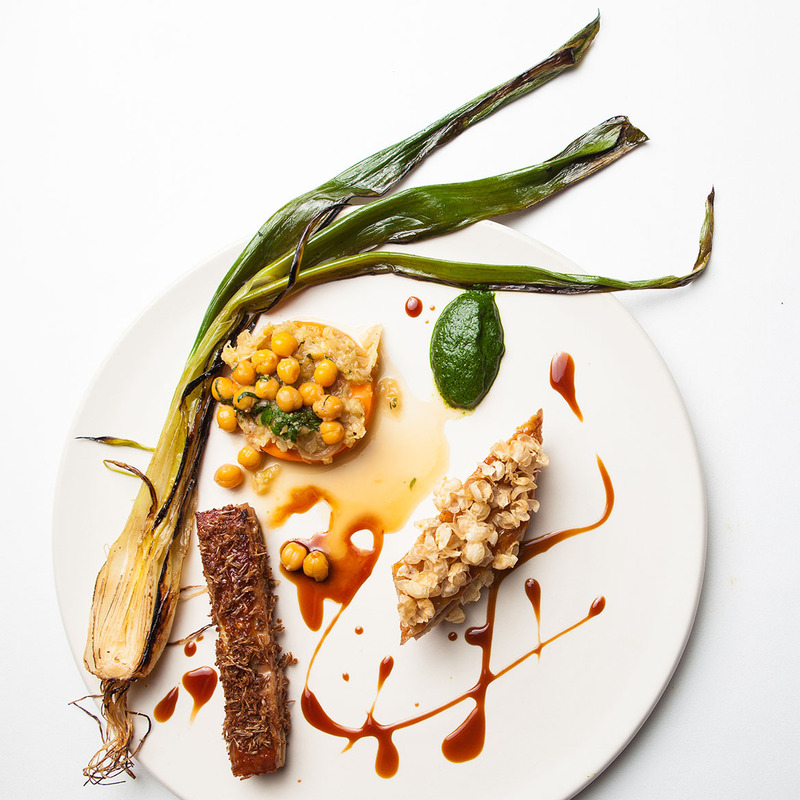 In attendance on the night, Harring saw firsthand her hard work seeking out sustainable food items turn into a stunning main dish such as Josue’s ‘Coq au Bière’, rooster with chickpea and winter vegetables. 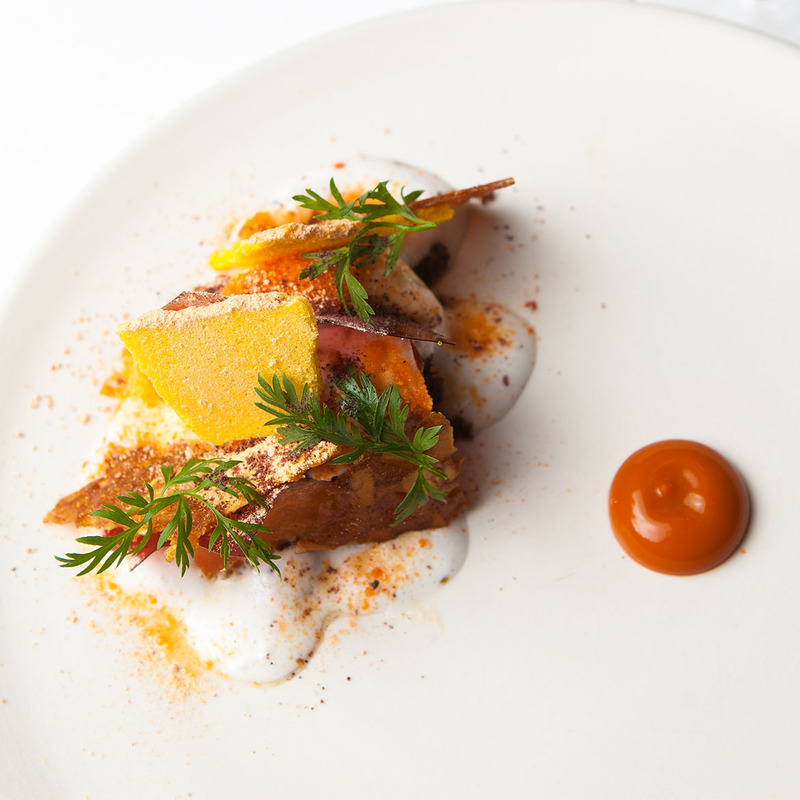 This dish was a striking example of how we can rethink fine dining with a conscience, and how the food industry can help turn the tide on mass waste. Our love for eggs and chicken has an extravagant reality – only hens are valued for flavour and laying ability, while millions of rooster chicks are discarded as a by-product each year. Harring thinks ‘Coq au Bière’ was brilliant not just because it heroes the rooster, but also because Lopez took the time to consider each other element on the plate to let the flavour of the protein really shine. Spent beer grains were procured from Stone and Wood brewers; carrot iota was made from jellified carrot puree and veloute; husks from the hand-hulled chickpeas were used as a crunchy element on the rooster; the entire shallot was used on the plate – Harring was delighted to taste the way the flavour changes from the roots, through the sweet white, to the green leaf tips. 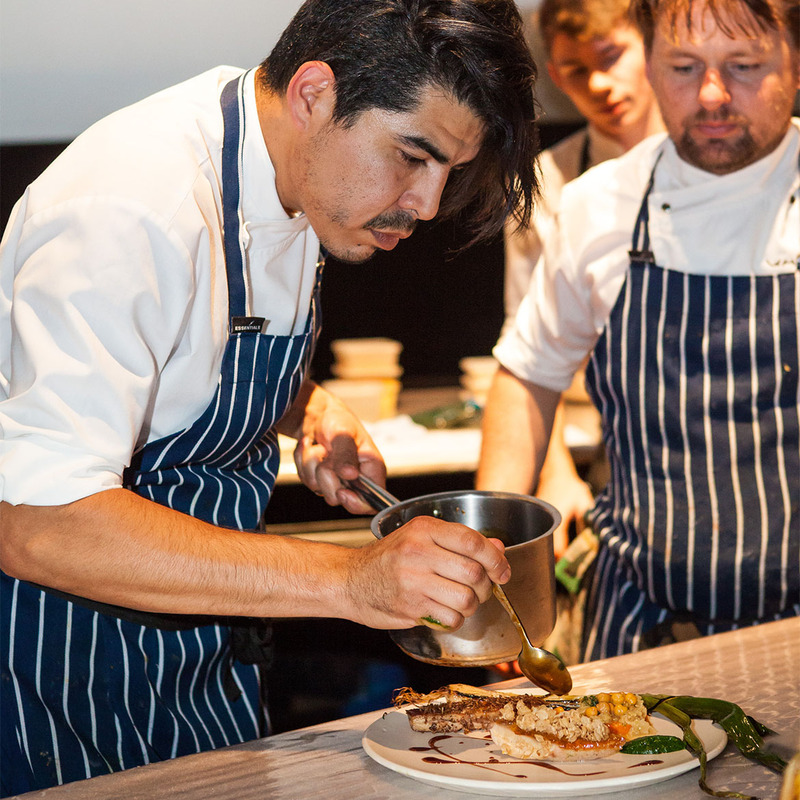 Lopez’s favourite dish he created for the dinner was the entrée ‘Cauliflower Gratin’ – always a crowd favourite, but with some unexpected plot-twists. Starting with a salt-baked cauliflower, the usual flour addition in the crust was replaced with spent espresso grounds and mixed with salt and egg before baking, while caramelised florets, and blanched leaves were taken in two different directions to create surprising yet familiar contrast. 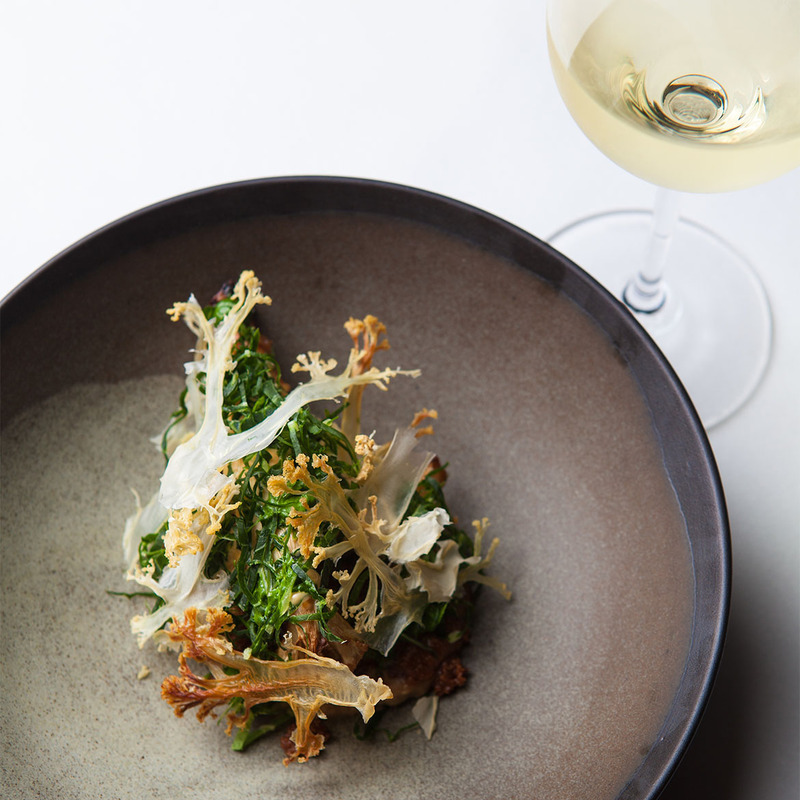 He included shaved and dehydrated florets, a fresh salad made from more of the cauliflower leaves, dressed with a spent-coffee dressing and topped with a brioche crumb. A hidden element beneath the crumb was ‘Gjetost’ (yay-toast), a Norwegian-style cheese created from whey, discarded from the goat’s-milk ricotta made for the dessert dish; the whey was caramelised and reduced with butter and cream to add the creamy flavour associated with Gratin. Two of Queensland’s champions for reducing food waste and loving ugly produce, special guests OzHarvest’s Queensland State Manager Amy Cobb and colleague Rebecca Spencer were thrilled to see their no-waste philosophy play out in the dining room. 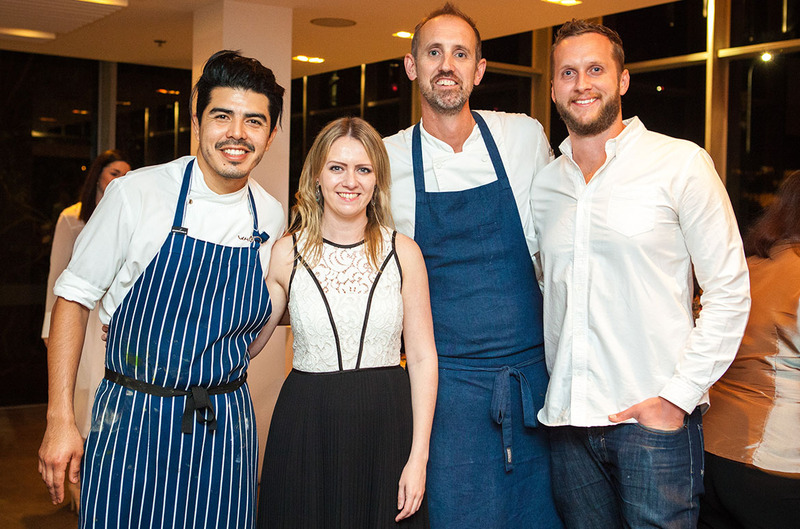 Both Lopez and Matthews are OzHarvest Ambassadors, with Matthews recently winning the Churchill Scholarship for Sustainability in Fine Dining – a 10 week tour educating and campaigning for applying ethical methods to restaurant kitchens around the world. It’s hard to think of where Lopez could possibly have squeezed more value from his ingredients. And humble ingredients, too. He’s excited to see a resurgence of ‘ugly’ vegetables, such as supermarkets trialling dedicated fruit stands for not-so-perfect produce and rescued food markets. Ask any of these food waste defenders where they source their products and each one will tell you – it’s not hard to find, you’re already handling it every day. Until 30 August 2017 experience Josue Lopez’s food philosophy at the GOMA Restaurant open Wednesday nights from 5.30pm and view the exhibition ‘Marvel: Creating the Cinematic Universe‘ at GOMA until 9.00pm. For all other reservations you can book online or contact the GOMA Restaurant on (07) 3842 9916. Open 12 noon – 3.00pm Wednesday – Sunday, and 5.30pm – late Friday. Join us for the exhibition ‘Marvel: Creating the Cinematic Universe‘ at our limited edition wine bar on GOMA Restaurant’s terrace from 3.00pm Wednesdays, featuring Xanadu wines and epicurean bar snacks at the Xanadu Wine Bar. No reservation required, find out more. Throughout the exhibition, including Wednesday evening, the Australian Cinémathèque at GOMA features a ticketed retrospective of the Marvel Cinematic Universe films. GOMA closes 9.00pm. 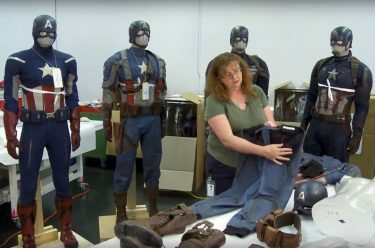 Go behind the scenes to experience more than 500 unique objects from your favourite films, including iconic objects which offer a glimpse into the work of production designers, storyboarding and pre‑visualisation artists, costume and prop designers, and visual effects artists alongside the original comic books which introduced the characters and influenced the films. Purchase tickets for ‘Marvel: Creating the Cinematic Universe‘ in advance online or at the GOMA exhibition ticket desk during the exhibition period. Tickets available onsite between 10.00am and 4.00pm daily, and until 8.00pm Wednesday. ‘Marvel’ film screenings and ‘Marvel’ Up Late are separate ticketed events. Feature image: Cameron Matthews, Group Executive Chef at Spicers Retreats, creates Caraway grissini, mushroom caramel by piping mushroom caramel onto the grissini.